Australian actor Daniel Lissing Reportedly Dating his co-star; Are they planning to get Married? Home Article 1.8 m Tall Australian Actor Daniel Lissing Has Rumor of Dating Erin Krakow, Is She Going To Be His Future Wife? 1.8 m Tall Australian Actor Daniel Lissing Has Rumor of Dating Erin Krakow, Is She Going To Be His Future Wife? Not every celebrity feels the need to be an open book when inquired about their dating endeavors. Some much rather prefer to keep their personal life under the radar. Daniel Lissing is one such celeb who barely gives anything away to the media as far as his love life is concerned. Despite Lessing's best efforts to maintain a private life, he's been rumored to be together with a gorgeous lady he knows very well from his profession as an actor. Is Daniel Lissing Married Or In A Relationship? Daniel Lissing is not a married person, and he prefers to keep his personal life extremely confidential. However, this never stops the media to chase after the details of his personal life. As per reports, Lissing is rumored to be dating Erin Krakow. They co-starred in the show When Calls the Heart where Erin portrayed the character of Elizabeth Thatcher while Daniel played Jack Thorton. The couple carries amazing chemistry on-screen, and impressively they replicate it off-screen as well, although neither of them has confirmed their dating endeavors in real life. However, judging by the way the two of them tend to look at each other, it definitely appears more than just friendship. Despite no official confirmation, they look like a couple more than besties. Erin has a very active social media, in particular, Instagram where her account is full of Lissing's pictures. In one of the posts, the duo was seen singing together with great synchronization. Their amazing chemistry is one of the reasons why many people believe the actors are dating. Despite so many rumors, the duo has kept the lid shut on providing actual confirmation. In fact, they have neither confirmed nor denied their rumored love affair. Even if the two of them are not dating, they could very well in the future since the likelihood of falling in love (if they haven't already) seems to be on an increasing trend. The fans certainly wish to see this adorable duo take their relationship forward. Meanwhile, we cannot claim with absolute certainty whether they're dating or just great friends. For now, what can be said with conviction is, Lissing is unmarried. He currently lives with his family in Los Angeles, California. Daniel made his acting debut playing a minor role in a TV movie titled Pizza back in 2001. In 2006, he made a guest appearance in the popular Australian series Home and Away. The actor played the role of firefighter Dave Elder. Lessing's first genuine movie role was as Matt in the film Whiteline which was released in 2009. Later, he had notable roles in several movies and TV films. These included Multiple Choice (2009) and Packed to the Rafters (2008-09). Moreover, Daniel also featured in Underbelly: A Tale of Two Cities (2009), The Game (2010), Fidelity (2011), and Cops L.A.C. (2010). In 2011, Daniel joined the cast of the series Crownies playing the character Conrad De Groot. He played the role until the end of the series the same year in 2011. The same year he featured in the movie Entwined, where he played Aiden. 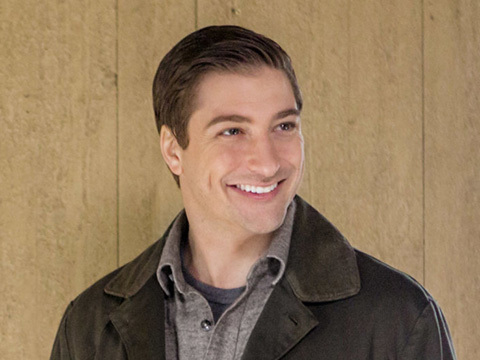 In 2012-13, Lissing played the lead character James King in the American TV series Last Resort. A year later in 2014, the actor joined the regular cast of When Calls the Heart. He has been portraying the character Jack Thornton in the series ever since. Born on 4th October 1981 in Sydney, Australia. He stands tall at 5 feet 11 inches. He is Australian by nationality and belongs to White ethnicity. He has one sibling sister and is an uncle to his niece Charlie. He is well known to Australian TV viewers as Conrad De Groot on Crownies. He played the role of Petty Officer James King in the ABC drama series Last Resort alongside Andre Braugher. He received his start on Australian TV in two episodes of Home and Away in 2006 which was followed by a couple more episodes in Out of the Blue.